The Jewish community is at increased risk for many genetic diseases that occur more frequently in this population. Genetic diseases commonly occur in isolated communities. This is not specific to the Jewish population, as many ethnic groups have unique genetic concerns. Jews of all backgrounds should consider carrier screening because they are all at risk to be carriers of genetic diseases. 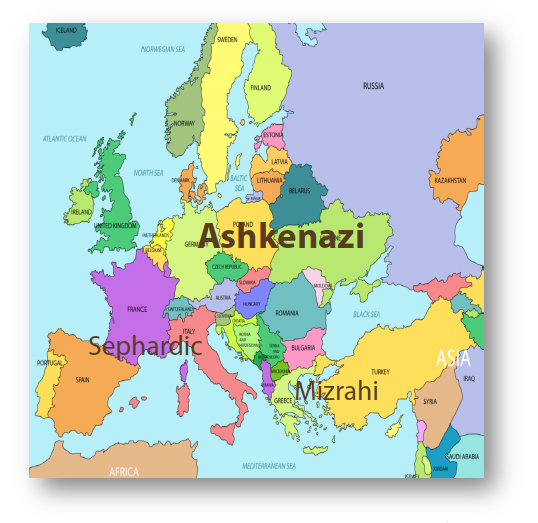 This includes Ashkenazi (Eastern/Central European), Sephardic (Mediterranean), and Mizrahi (Middle Eastern/Northern African) Jews. There are two approaches to carrier screening: ethnicity based screening and expanded carrier screening. In ethnicity based screening, you are tested for disorders based on your ethnicity or family history. This is the way all carrier screening of Jews was done in the past. In the 1970s there was only one test available, an enzyme screen for Tay-Sachs disease for Ashkenazi Jews only. As discoveries about the genetic cause of diseases evolved, the list of disorders – called a test panel – for which all Jews could be screened consistently improved. Over time, however, we have learned that ethnicity based screening has many limitations. Today, with expanded carrier screening, many disorders can be screened for without focusing on either race or ethnicity. Most national genetics and reproductive medicine societies support the use of these expanded carrier panels for all individuals. As a result, highly accurate carrier screening is now available for Jews of all backgrounds – Ashkenazi, Sephardic and Mizrahi – as well as couples of mixed heritage.